I'm going to start with an aside today. Henry Jenkins is too pedestrian a name for someone whose work is so powerful, influential and approachable. And especially whose work relates so much to a pop culture filled within nicknames and handles and cool-sounding titles. So to place him among other heroes like Henry "We named the dog Indiana" Jones, I'm going to start referring to him as Doc Jenkins -- not unlike other heroes like Doc Savage or Doc Brown. So, from here on out, Doc Jenkins is the norm! But that's kind of ancillary to the discussion. It wasn't particularly that this group happened to choose a superhero theme to act as an ersatz police force. They could have just as easily set up shop to look like Dr. Who's UNIT, Star Wars' Galactic Empire, Judge Dredd's Justice Department, or any of a hundred other fictional police/military forces. For that matter, they needn't have even followed that much of a theme, and just presented themselves as a loose-knit posse of concerned netizens. 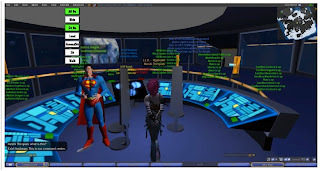 Both could play their own games, explore their own fantasies, and it became an issue because their actions impinged on each other's experience and impacted a much larger community of players. In other words, at least two different games collided in that moment. Doc Jenkins is, of course, talking about the online game world here. But isn't that idea perfectly adaptable to the real world? Indeed, isn't it just a reflection of the real world? In the online world, the clashes occur between those who take their cues from the orderly, superheroic worlds in DC comics, and the more anarchist view of the pranksters. Both groups have their ideal of what their online world should look like and, as Doc Jenkins noted, they sometimes collide. The mores of one group conflict with the mores of another. Sound familiar? That was essentially the basis of my "Us vs. 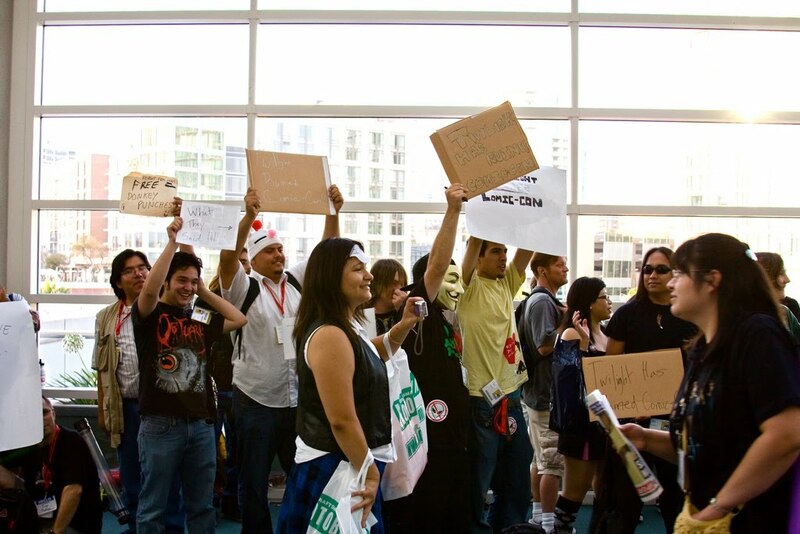 Them" chapter of my book It's the Twilight haters at Comic Con International, protesting with hand-made placards and t-shirts. It's the "Vampires don't sparkle!" taunts. It's the lack of understanding (which leads to fear which leads to hate) the differences between "Us" and "Them." It's the notion that anyone who falls in an outgroup is inherently bad, simply based on the fact that they're no in an ingroup. It falls very much under our old lizard brain knee-jerk response mechanisms. Logically, we know that it's a load of hooey to judge somebody like that, but we end up doing it anyway. We fall back on broad stereotypes ("all comic fans hate Twilight fans") because it's a quick and easy way for us to respond to people. I don't have to spend time getting to know and respond to you as an individual if we're only going to meet for a minute or two in the elevator anyway. I can sum up your interests, preferences, ideals, lifestyle, etc. by comparing you to other people LIKE you that I've already had contact with. It's a mental shorthand we, as humans, use to determine whether or not we can/should deal with someone. Marvel/DC. Republican/Democrat. Israeli/Palestinian. Us/Them. But these conflicts happen most frequently "when worlds collide!" When Twilight fans show up to comic conventions. When a Buffy fan starts heading into a comic shop. When a Shaenon Garrity fan follows some of her work for Marvel and starts talking to old school Marvel fans. Is it simply a matter of avoiding those online dens of insularity? That seems to cater to that particular brand of xenophobia. Is it some kind of attempt to educate people to be more open and accepting of people from outgroups? Well, realistically, we've been trying to do that for centuries with little result. Or is it part of the ongoing struggle that is what makes us human? Doc Jenkins ends his piece by saying, "Playing well together is something we were supposed to have learned in kindergarten, but as this story shows, doing so is not as easy as it seems." And I'm left to wonder if it's a lesson we ever really learn. Interesting! I found this blog because I have a google alert set up for "webcomic" and found a post below that relating to some people I talk with on a daily basis. I was first made aware of that article by one of the people in the JLU and I have to say, I'm pretty shocked at what passes for academic discourse these days. The spin put on the JLU activities as "they're big meanies who won't let us have fun" is amazing to me. I think it's fair to characterize it as a case of "Us vs. Them" but it's one born of ideology. On the one hand you have people who want the "freedom" to do what they want, even if it harms others, and on the other you have a group that has to clean up the mess they leave behind.